This product is a result of the cooperation between Gallien-Krueger, the leading bass amps and speakers company, and Audified. The Pro 2 version includes 2 independent speakers, Single speaker mode, and Presets utilizing dual speakers. 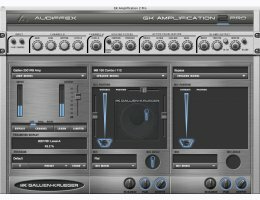 GK Amplification plug-in includes models of Gallien-Krueger amps and speakers. The installation includes AAX, RTAS VST, AU versions of the effect.